"The heart of a fool is in his mouth, but the mouth of a wise man is in his heart. "Benjamin Franklin, Poor Richard, 1733. Paul Cezanne lived to paint. He captured the essence of nature in his subjects, whether animate, artificial (still life), or natural (landscapes). He led a quite life of painting in order to discover and perfect the principles of composition and coloration. He did not paint according to criticism, but only according to his own philosophy and taste. The black line is the foundation of his composition. Contrasting colors complement the line drawing and give form to the figures. The colors are applied in patches, working from light to dark to retain the brilliance. Thus, the trunks of trees are light reddish-brown in a black outline cutting across a darker background of greens and reds. Cezanne also liked to blend his green or red with black to create dark shadows around and behind his objects, making a high contrast with the brightly colored foreground objects. 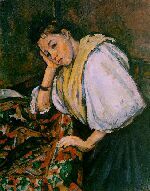 Gauguin also used this style (although in a more two dimensional Asian style) being heavily influenced by Cezanne, as were many other post-impressionist painters. Cezanne uses line to define color, and color to define line. Many of his paintings are oriental in this regard. 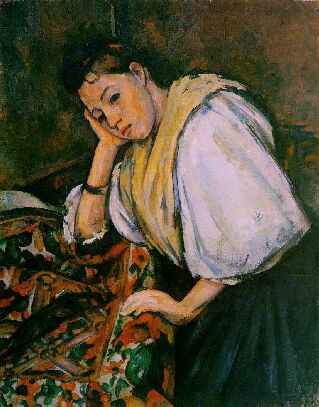 However Cezanne uses color as an equal rather than a subordinate element. He was the first to perfectly balance line and color. Cezanne is thus a also a natural water color artist. His style can work in almost any medium. Welcome to the Polymath Society International! The power of mind conquers all fear and anxiety. should be, you have entered the domain of the self, true self-consciousness. It is still an ideal world, a world out of joint with the coldness beyond, the pettiness beyond. as learning can never be forced, but free and conscious discovery.